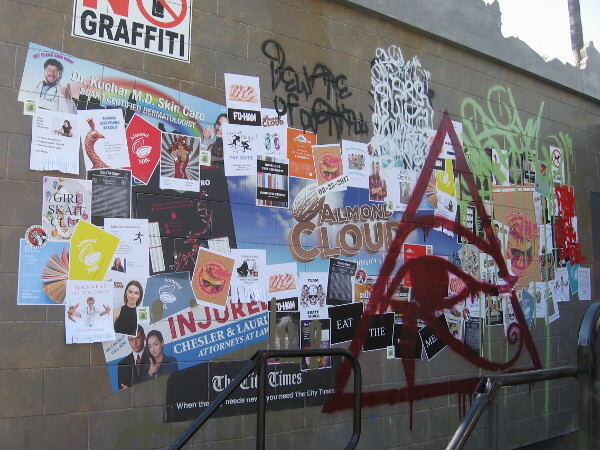 advertisements – Cool San Diego Sights! Huge helicopter, banners appear for 2018 Comic-Con! 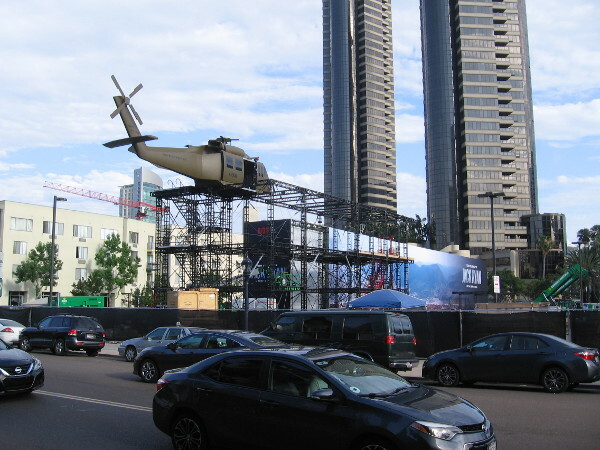 A huge helicopter now stands high above the street on a steel structure for the Jack Ryan Experience at 2018 San Diego Comic-Con! Check it out! 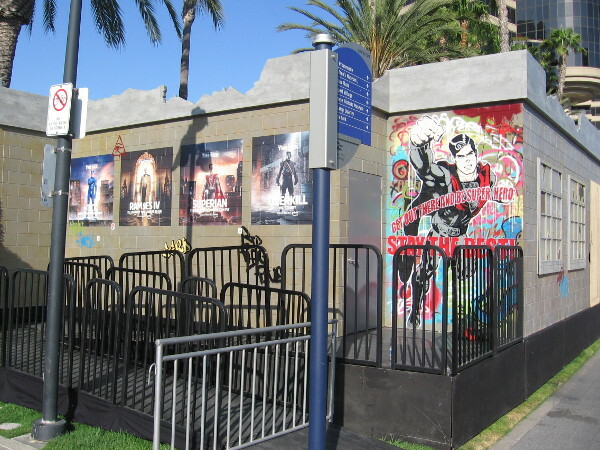 More cool stuff is appearing around downtown for 2018 Comic-Con! The Jack Ryan Experience has been under construction for a few days now, and that helicopter I spied in the parking lot is now way up in the air on a huge steel structure. 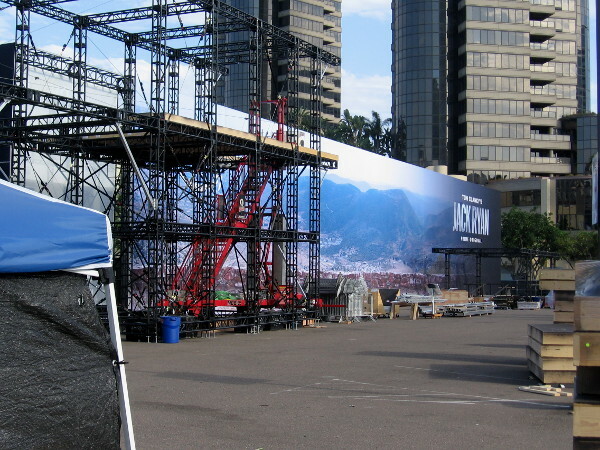 It appears the zip line will descend from the helicopter across a backdrop depicting a rugged Middle Eastern landscape! 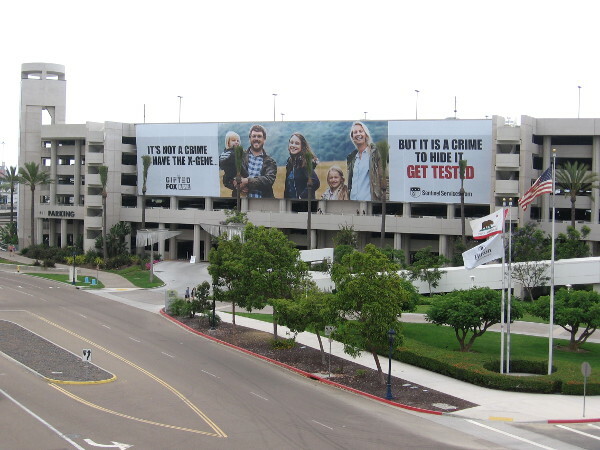 I also spotted three gigantic banners hung from the parking structure of the Hilton San Diego Bayfront. They advertise two upcoming video games: Shadow of the Tomb Raider and Kingdom Hearts III. Ten days to go until Comic-Con officially opens! The Jack Ryan Experience graphic backdrop appears complete. Lots of crates in the parking lot indicate there’s much more set to up before this Comic-Con offsite is ready. A look at the gigantic Jack Ryan helicopter from across the street. A zip line will run from it along a Middle Eastern aerial landscape. 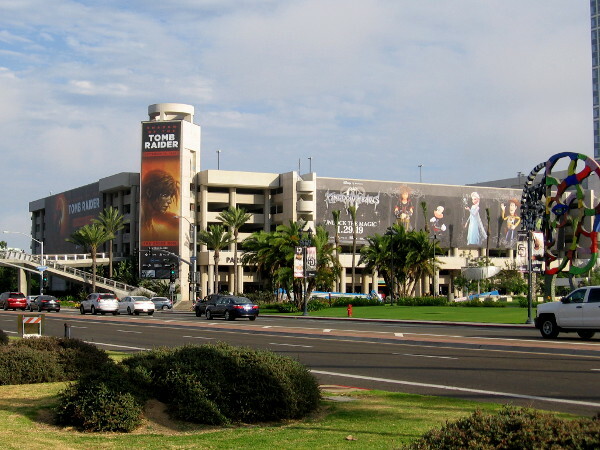 The Hilton Bayfront parking structure has three huge banners hung as of today for 2018 San Diego Comic-Con. 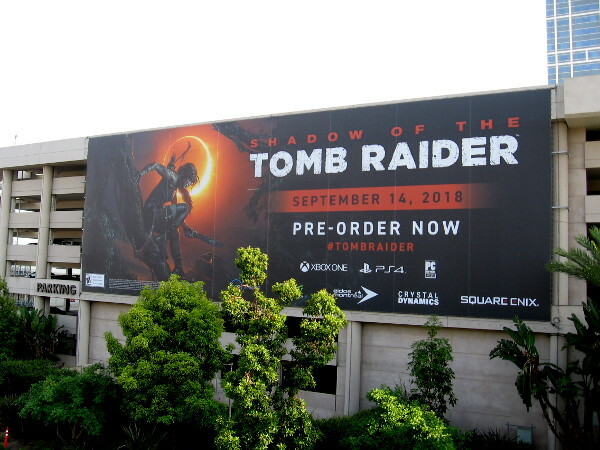 A prominent banner facing Petco Park and downtown promotes the upcoming video game Shadow of the Tomb Raider. 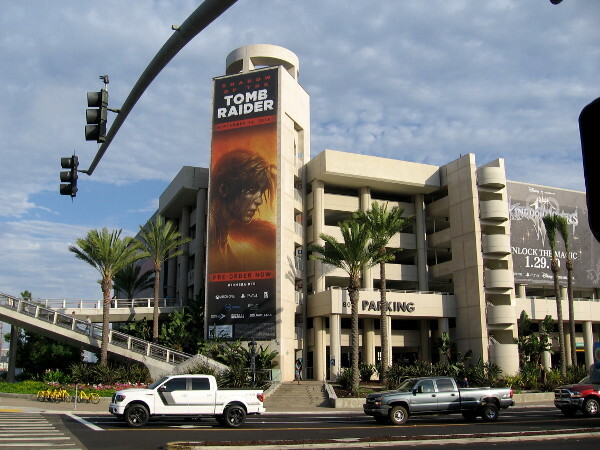 Another banner on the Harbor Drive side of the parking structure also advertises the new Tomb Raider game. 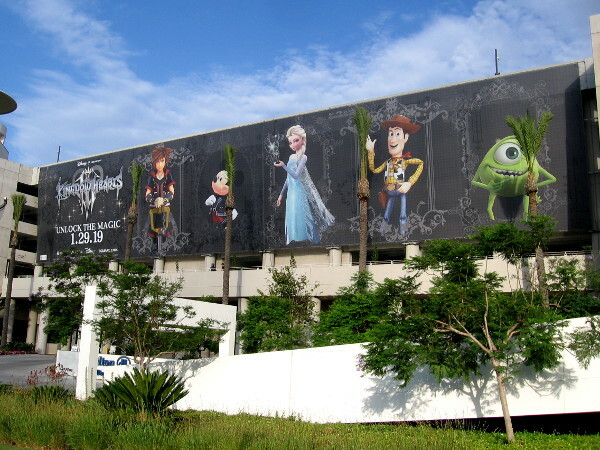 A huge banner facing the San Diego Convention Center features Disney characters and promotes Kingdom Hearts III which debuts early next year. 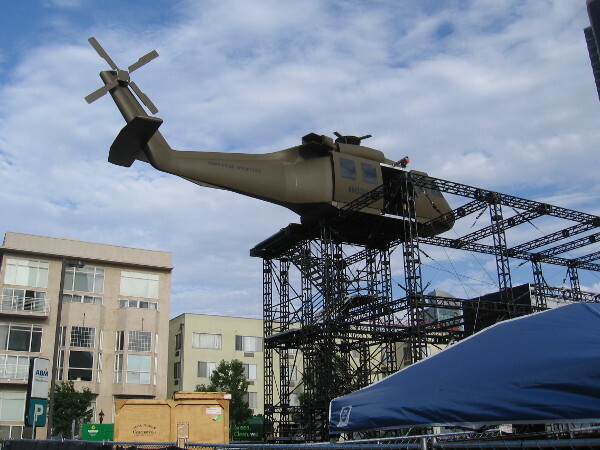 Posted on July 9, 2018 Tags advertisements, banners, comic-con, construction, cool, disney, entertainment, events, helicopters, marketing, pop culture, san diego, television, video gamesLeave a comment on Huge helicopter, banners appear for 2018 Comic-Con! More signs that 2018 Comic-Con is coming! 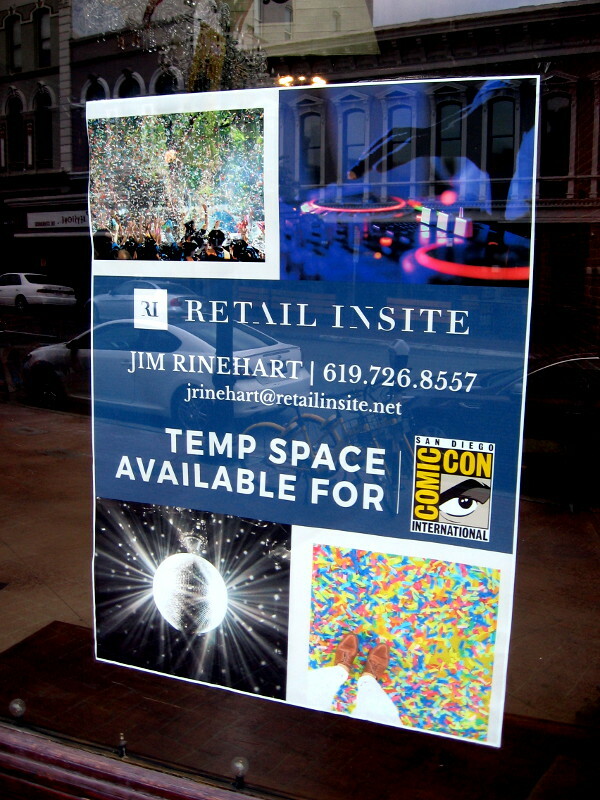 According to a sign in a window, the retail space at 635 Fifth Avenue is available as a temporary space for San Diego Comic-Con. Two weeks to go and counting! 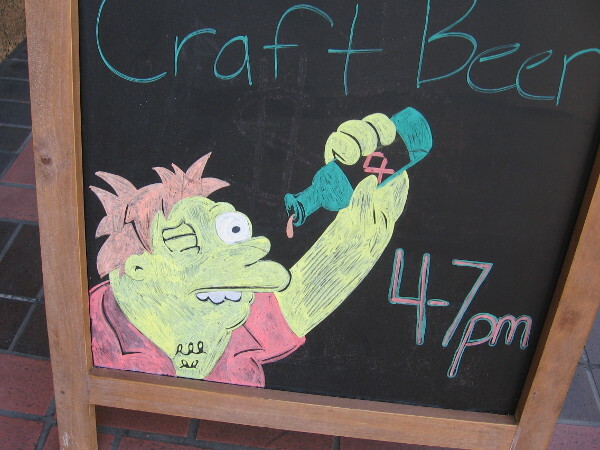 I’ve spotted a few more signs that San Diego Comic-Con is on the way! I suspect most of the building wraps, banners, and offsite venue construction will begin materializing sometime next week. I’ll keep watching for new stuff! 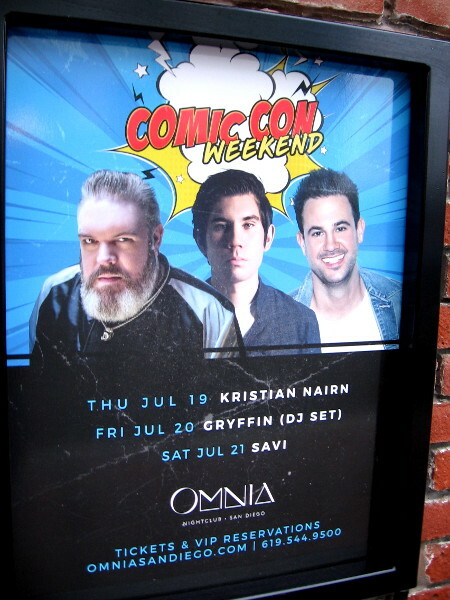 Omnia nightclub has its lineup ready for Comic-Con weekend. 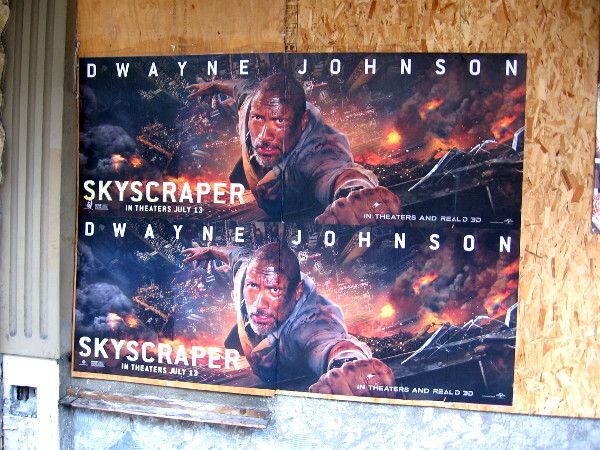 An advertisement for the upcoming movie Skyscraper has been conveniently slapped on a construction site near the center of the Gaslamp Quarter. 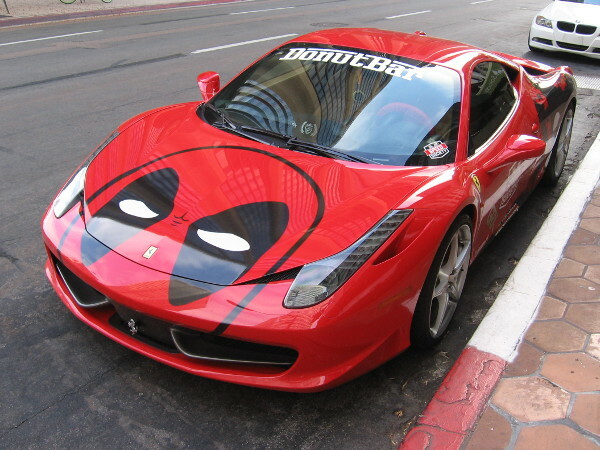 Chef Santiago of the Donut Bar has his cool Deadpool Ferrari parked on B Street. 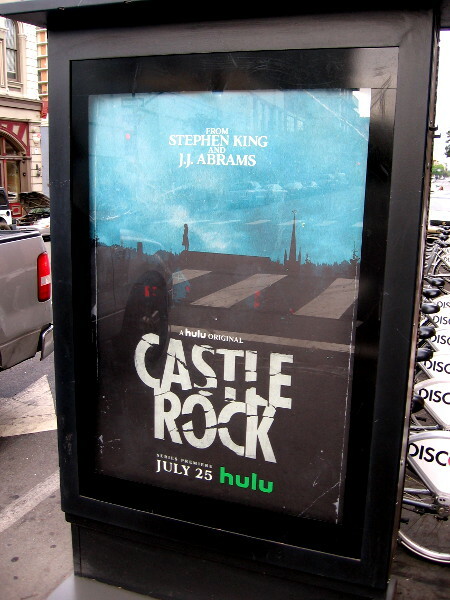 A couple of posters promoting Castle Rock have appeared in the Gaslamp, including a coveted spot near the Tin Fish. 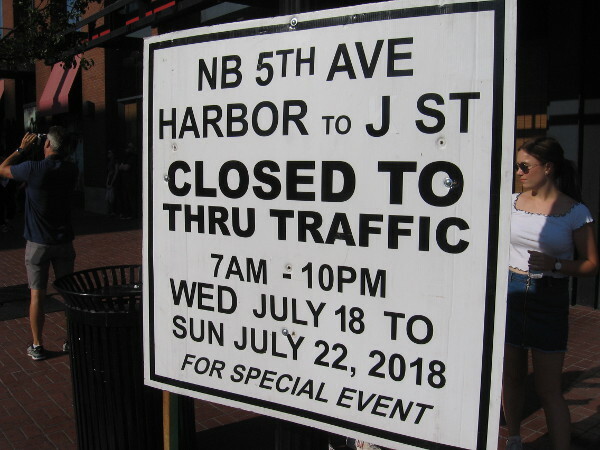 The City of San Diego has placed signage out indicating street closures for a very special event: 2018 Comic-Con! 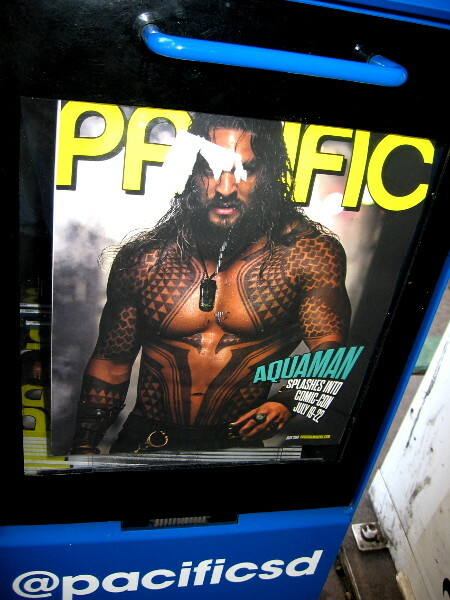 Posted on July 5, 2018 Tags advertisements, cars, comic books, comic-con, cool, entertainment, events, gaslamp, movies, photo, pop culture, san diego, signs, superhero1 Comment on More signs that 2018 Comic-Con is coming! Cool sights on a walk to catch the trolley. 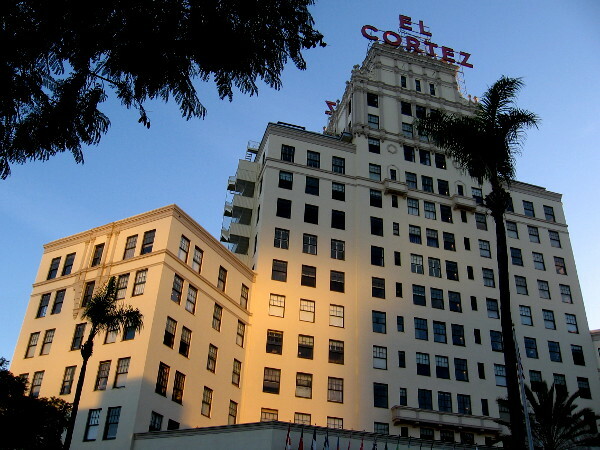 As I headed off to work early this morning, I felt compelled to walk down Seventh Avenue past the El Cortez. This morning I walked down from Cortez Hill to catch a trolley for work. I had no set plan. I had ample time. 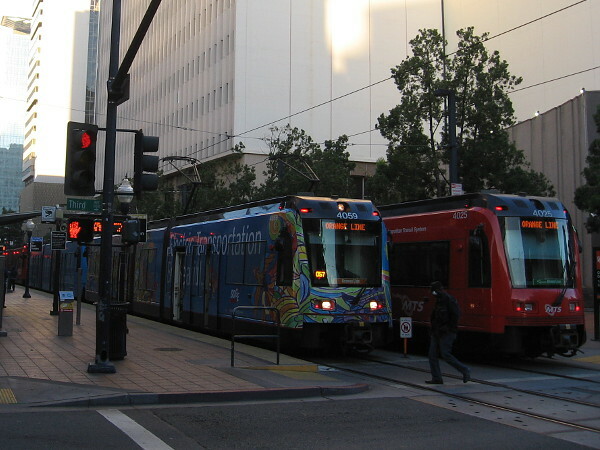 Any downtown trolley station would be just fine. My feet followed my wandering eyes. 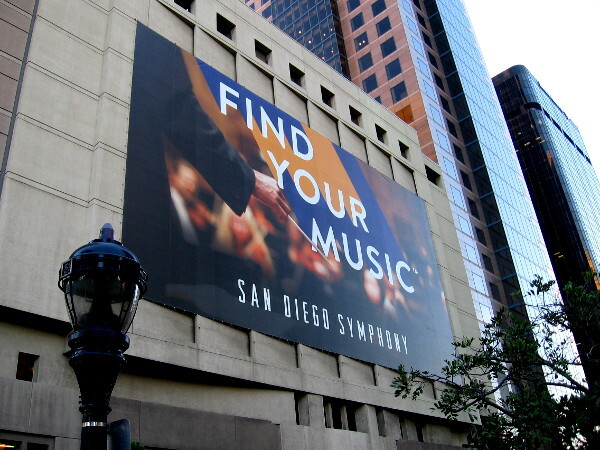 The San Diego Symphony has a brand new banner on the west side of Symphony Towers. Find Your Music. Almost to B Street. 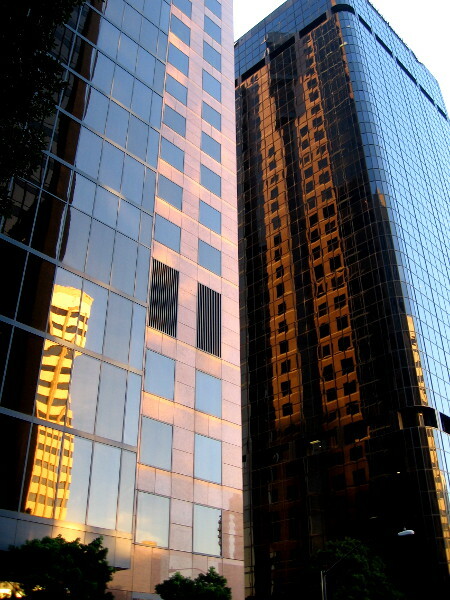 Some cool reflections produced by the early sunlight. 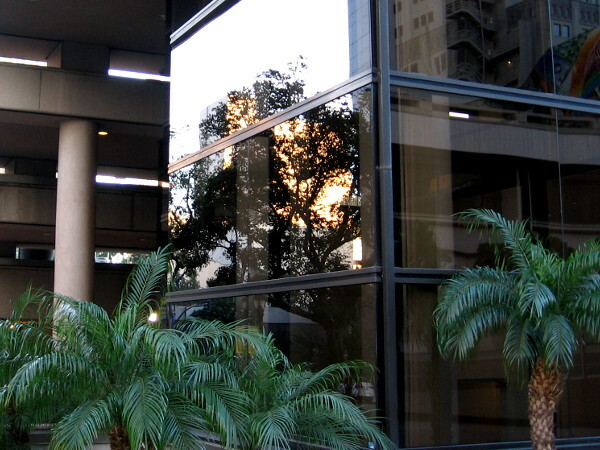 This reflection of a tree on windows seems dreamlike, unreal. 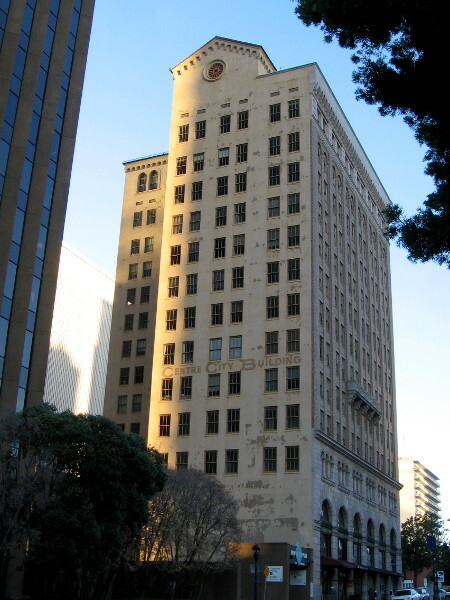 The old Centre City Building might have peeling paint, but it still rises handsomely into the San Diego sky. One edge is touched by the morning sun. 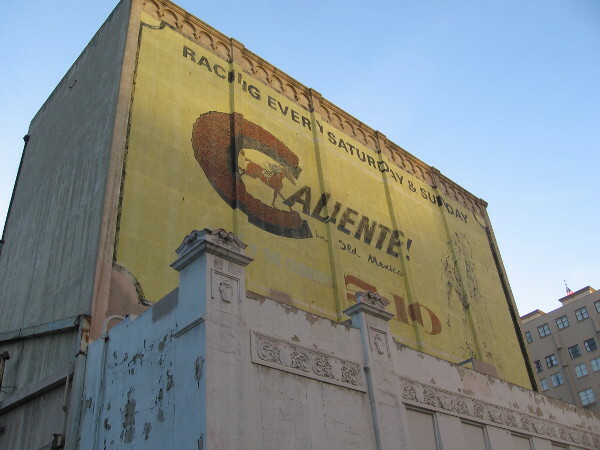 The cool old Caliente ad remains on the rear of the abandoned California Theatre building. I don’t know if it will be preserved when the historic building makes way for a new 40-story The Overture high-rise. 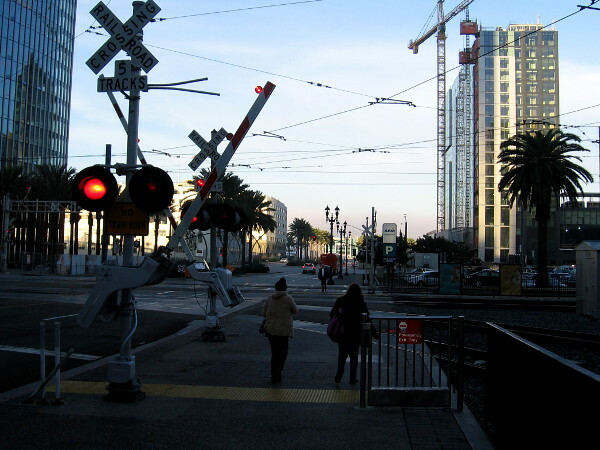 Shall I catch a trolley at the Civic Center station? Nah. I still have plenty of time. 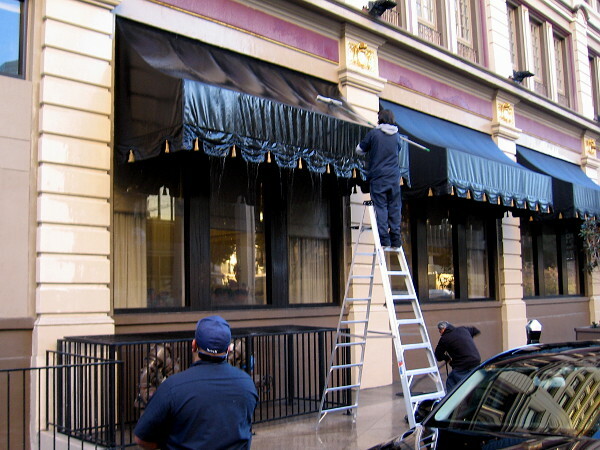 Workers were cleaning awnings over the ground floor windows of the U.S. Grant Hotel. 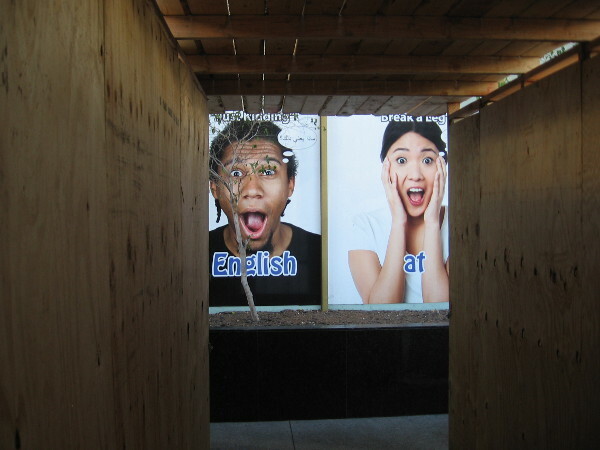 As I walked along Broadway past some construction, it looks like I frightened a couple of people! 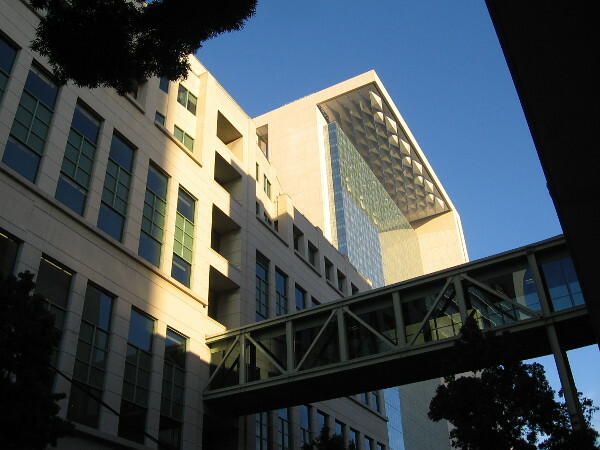 The brand new San Diego Central Courthouse behind the Hall of Justice provides an interesting photographic opportunity. Almost to Santa Fe Depot. Just missed a Green Line trolley. I’ll wait for the next one. Posted on January 17, 2018 Tags advertisements, banners, buildings, cool, cortez hill, downtown, el cortez, morning, photography, reflections, san diego, signs, trolley station, walking3 Comments on Cool sights on a walk to catch the trolley. 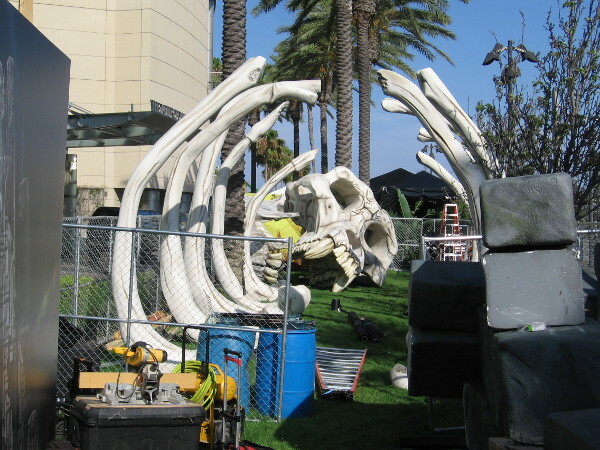 More photos of preparations for 2017 Comic-Con! 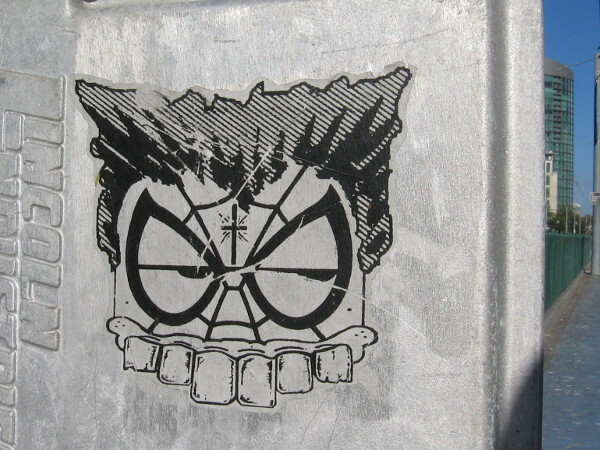 Artwork at The Tick Takeover site for 2017 San Diego Comic-Con. 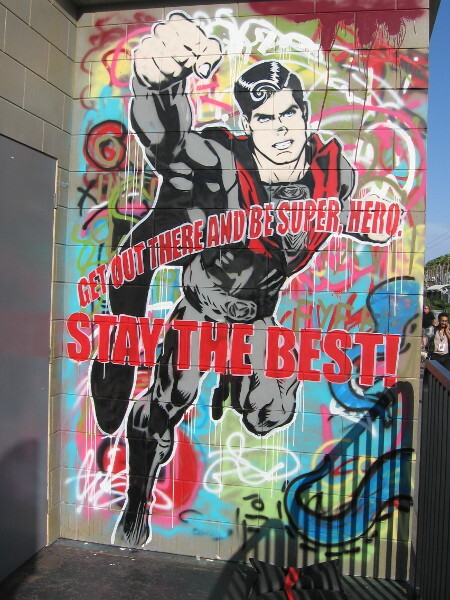 Get out there and be super, hero. Stay the best! It’s now Tuesday evening. I walked around taking more photos today of preparations underway for 2017 San Diego Comic-Con! Lots of new stuff has popped up since I blogged a bunch of photos yesterday. 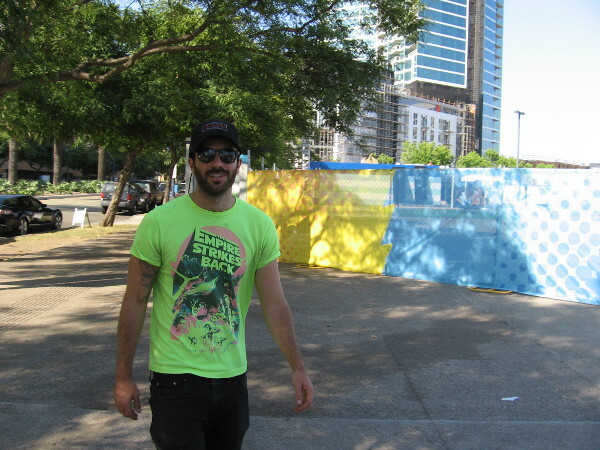 Here are shots from all over downtown and around the convention center! 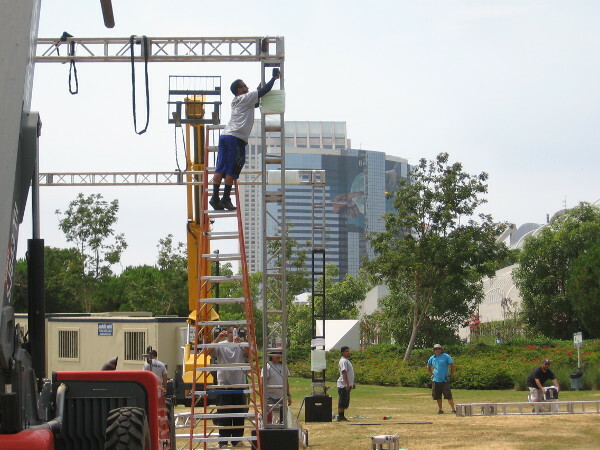 Looks like most of the building wraps and outdoor venues are just about ready! And I spotted some other stuff, too! 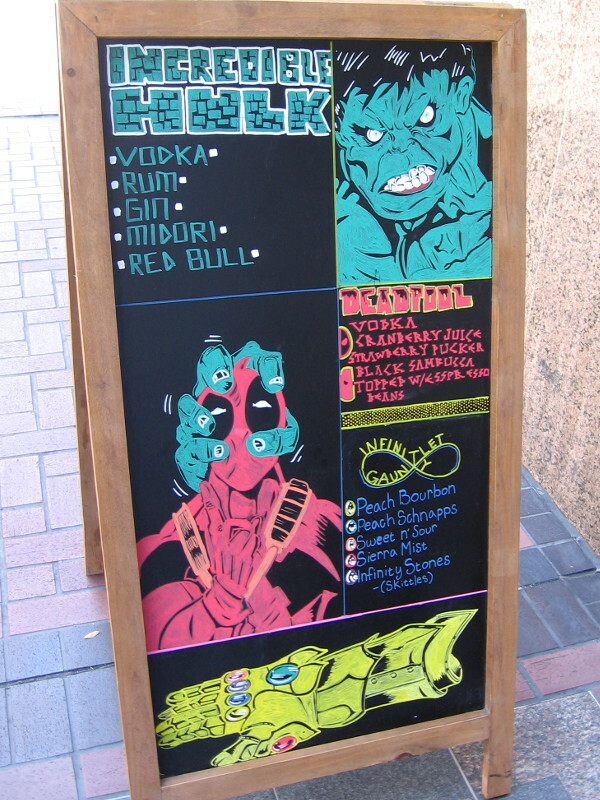 Funny sign on downtown San Diego sidewalk depicts Hulk squeezing Deadpool’s head and the Infinity Gauntlet. 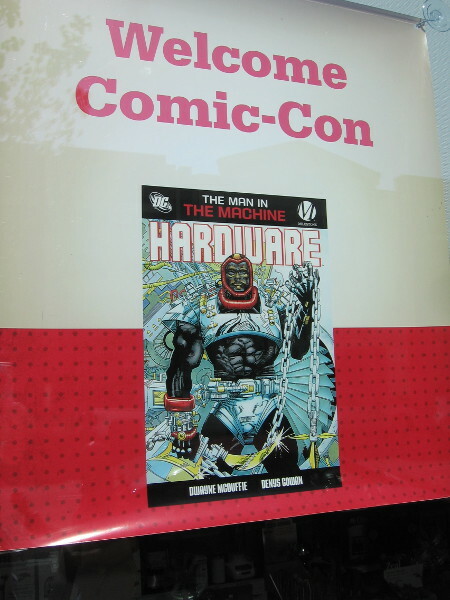 Downtown Ace Hardware has Hardware in their window for Comic-Con! Ready to move these into the Ron English Art exhibit in East Village, which opens Wednesday. 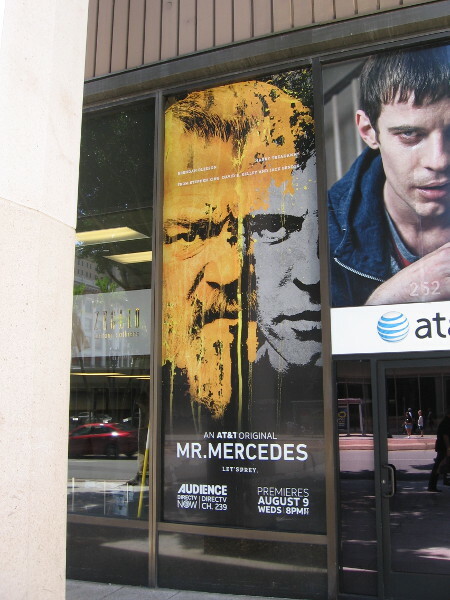 Graphic in store window promotes AT&T original series Mr. Mercedes. 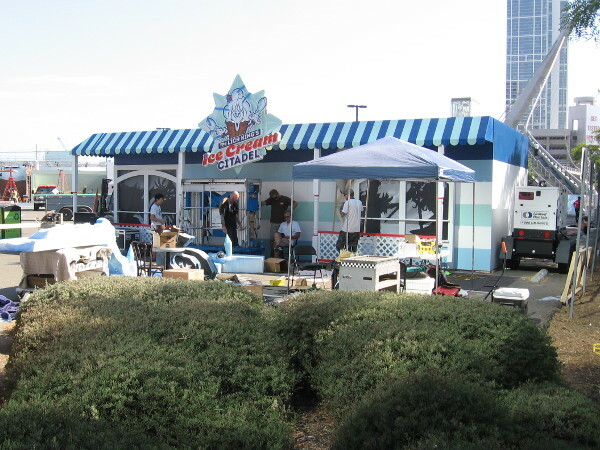 Getting the Ice Cream Citadel ready in the Petco Interactive Zone. 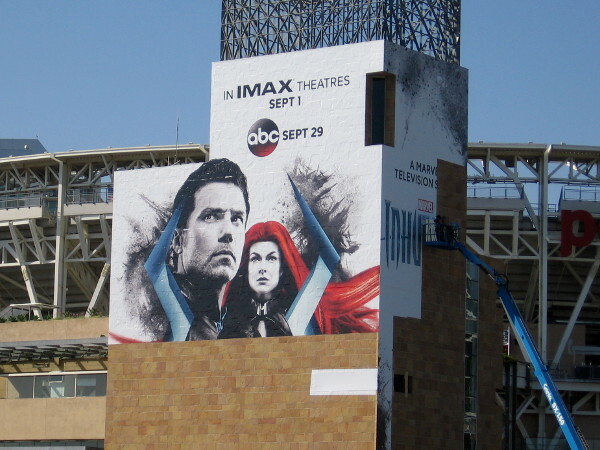 A cool Inhumans wrap is being applied to Petco Park! 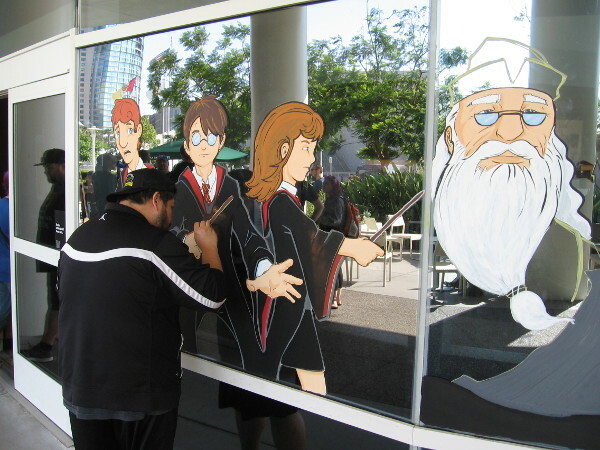 Artist paints Harry Potter characters in windows of the Hilton Bayfront Starbucks. I see Ron, Harry, Hermione and Dumbledore in this photo! 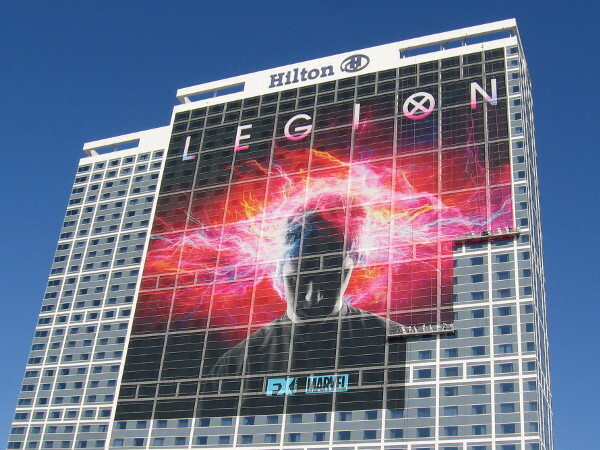 The awesome Legion wrap on the Hilton about finished! More stuff up at the FXhibition area. 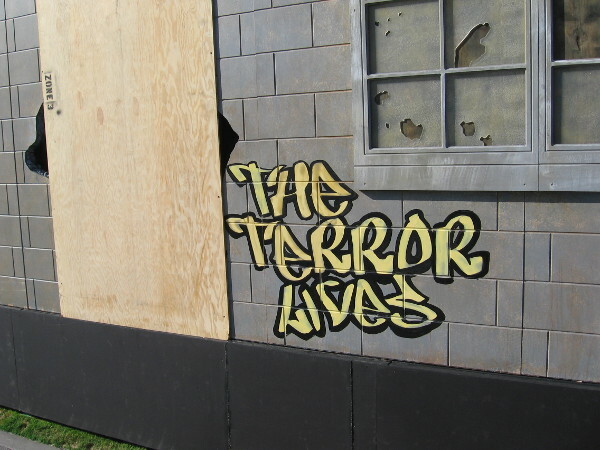 A building is being built to promote FOX’s new television series Ghosted. 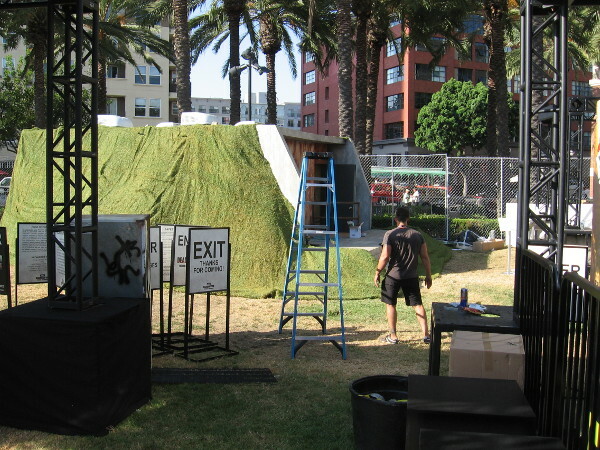 In the FX area there’s a place to get an American Horror Story sneak peek. 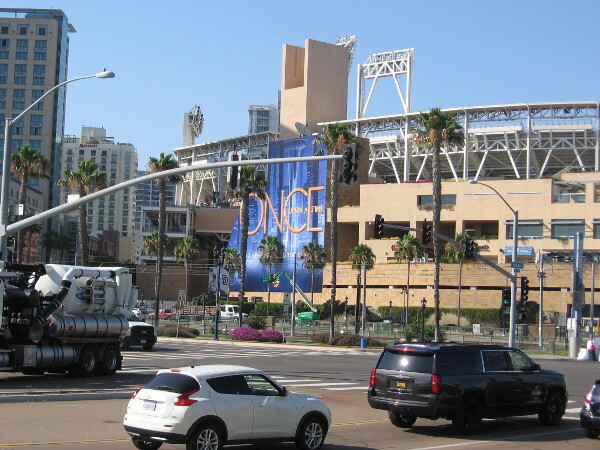 Looking back toward Petco Park, I see the Once Upon a Time wrap. After crossing the Harbor Drive pedestrian bridge, I got a pic of this cool Empire Strikes Back shirt! Another look at the very cool Marvel Inhumans wrap. I hope Black Bolt doesn’t have too many speaking parts. 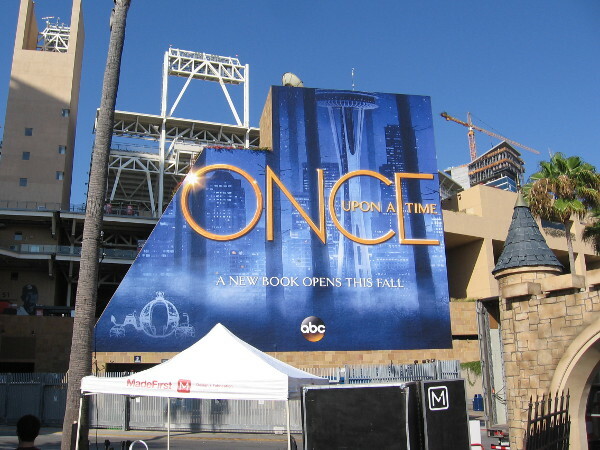 The Once Upon a Time wrap for 2017 Comic-Con is really eye-catching. A small castle has appeared! This History Channel site is called Guardians of the Gear. Knights Templar will guard your swag. You’ll also find the Holy Grail here! 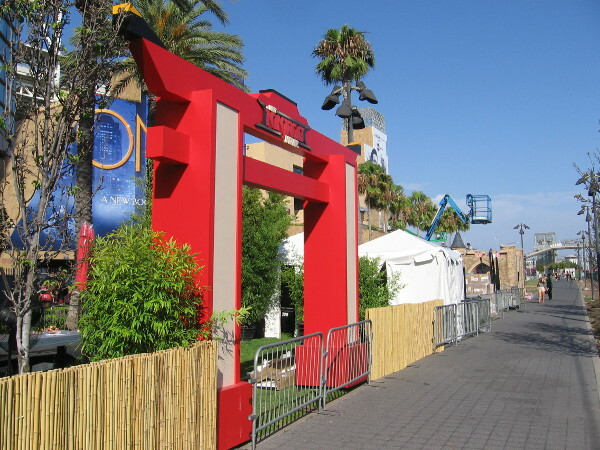 There’s going to be a Lego Ninjago Movie site here. There’s now a tunnel of massive bones at Kong: Skull Island! More work going on at the NBC Midnight, Texas 4D Experience site. The cool Midnight, Texas building near the Tin Fish appears nearly complete. 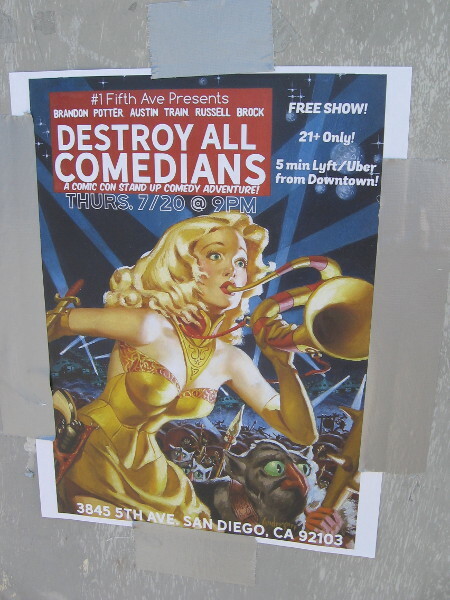 A poster advertises Destroy All Comedians! 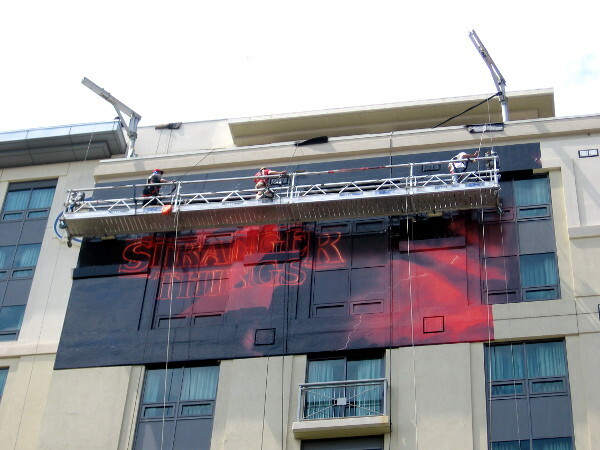 The cool Skydance Interactive wrap on the Hard Rock Hotel is almost done! All the Netflix wraps on the Hilton Gaslamp also appear to be done. 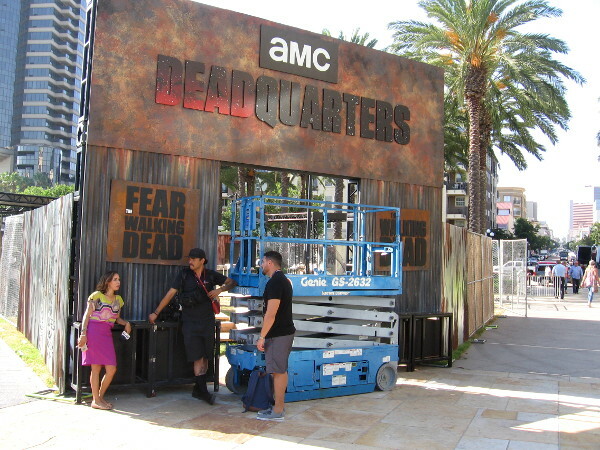 The entrance to AMC’s Deadquarters is almost ready to accept new victims. 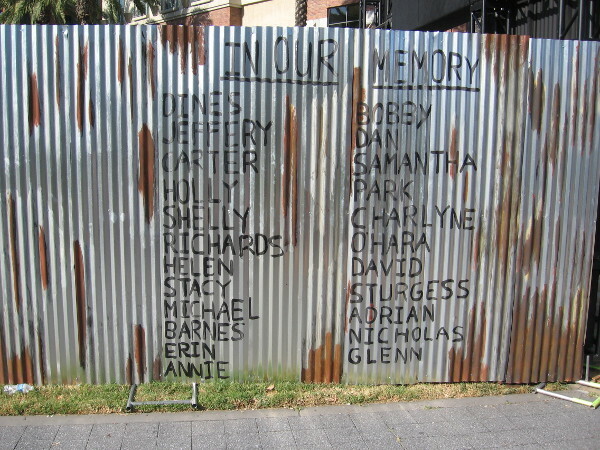 A fence near the Deadquarters entrance lists victims of the undead. They’ve got a zombie-proof bunker! 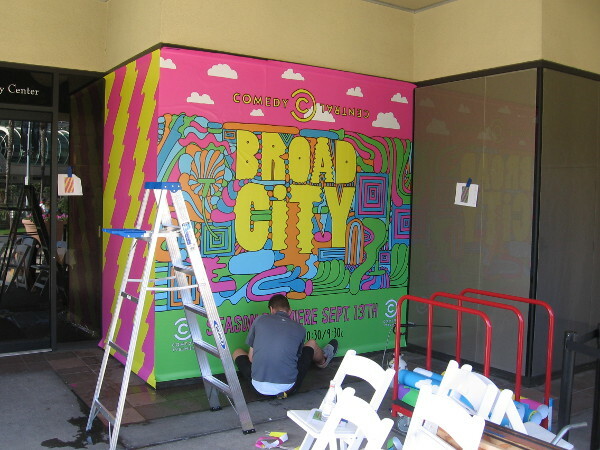 Someone paints a graphic along MLK Promenade promoting Broad City on Comedy Central. 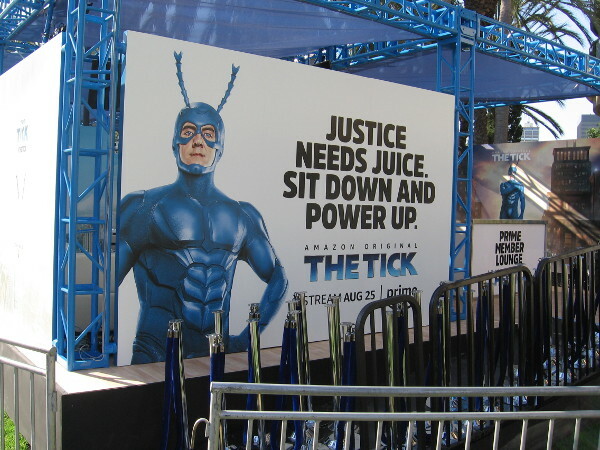 The Tick Takeover includes an Amazon Prime member lounge. Now to get The Tick’s antennae to function! 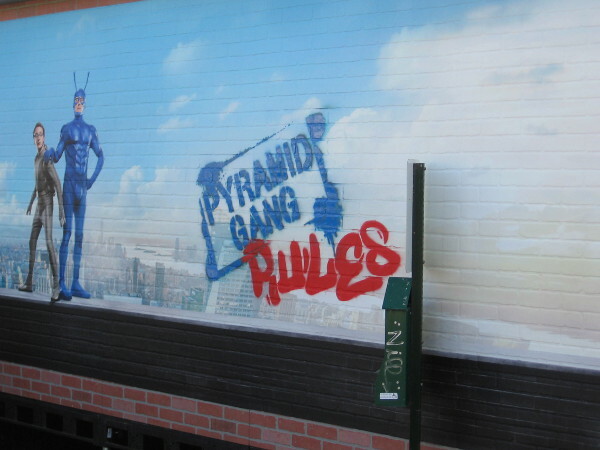 Graffiti and vandalism at the Tick Takeover. Goodness gracious. A villain spray painted a warning. Another side of The Tick Takeover. 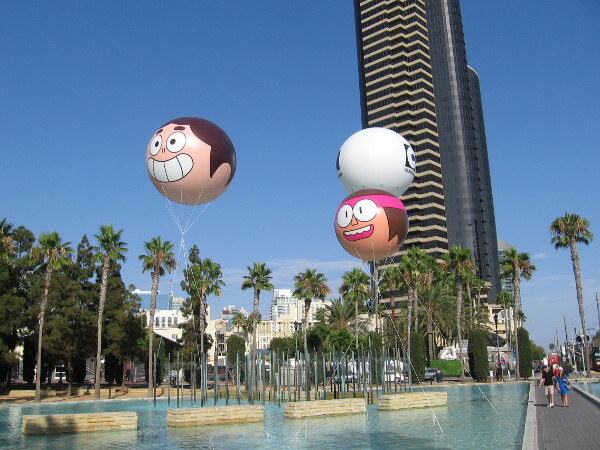 Guys were inflating character balloons that promote the Cartoon Network. I was told this year there will be 17 balloons. Wow! 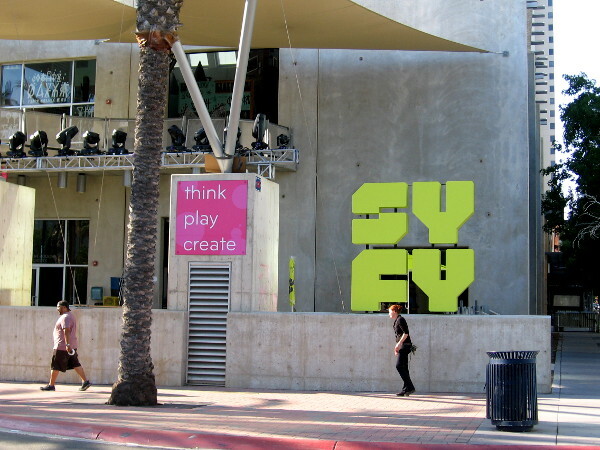 The New Children’s Museum appears ready to host Syfy. 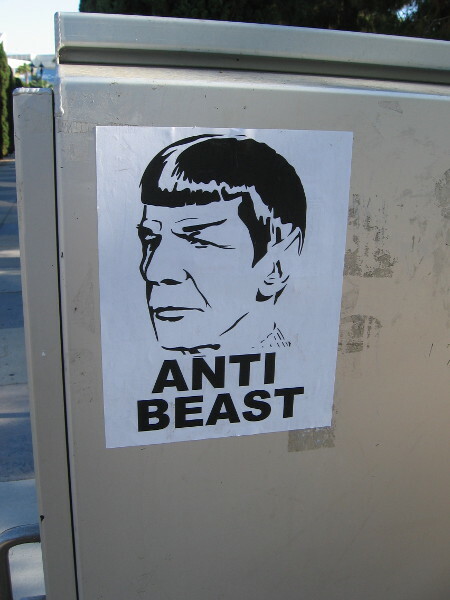 Is Spock the Beast? Or the Anti-Beast? 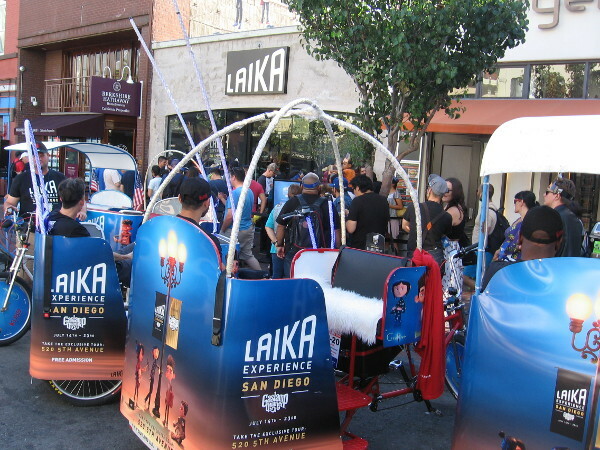 Lots of pedicabs on Fifth Avenue promoting the Laika Experience are in front of that cool exhibit. 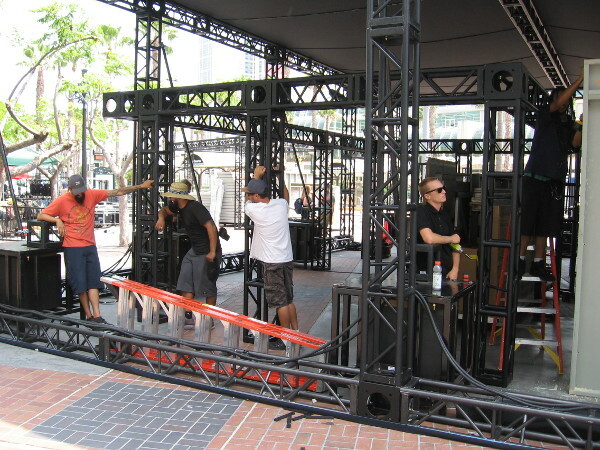 San Diego Comic-Con exhibitors are getting ready in front of the convention center! I’m ready for 2017 San Diego Comic-Con! 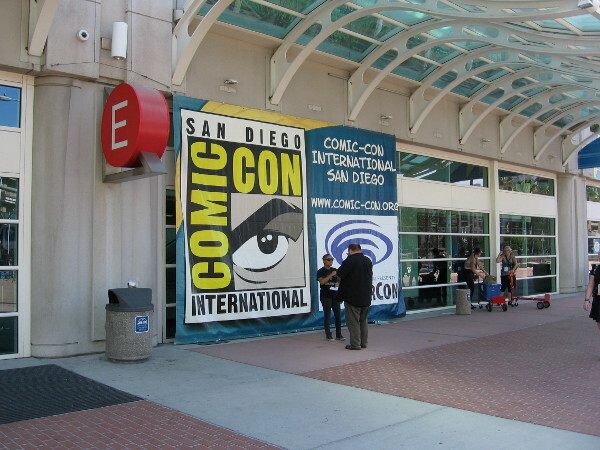 Posted on July 18, 2017 July 19, 2017 Tags advertisements, cartoons, comic books, comic-con, convention center, cool, entertainment, events, movies, photography, pop culture, san diego, superhero, television3 Comments on More photos of preparations for 2017 Comic-Con! 2017 Comic-Con wraps, construction underway! 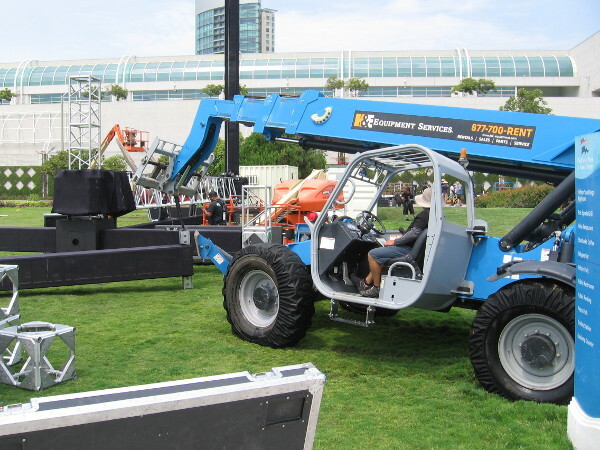 Lots of activity on the grass behind the San Diego Convention Center. It’s the Saturday before 2017 Comic-Con! 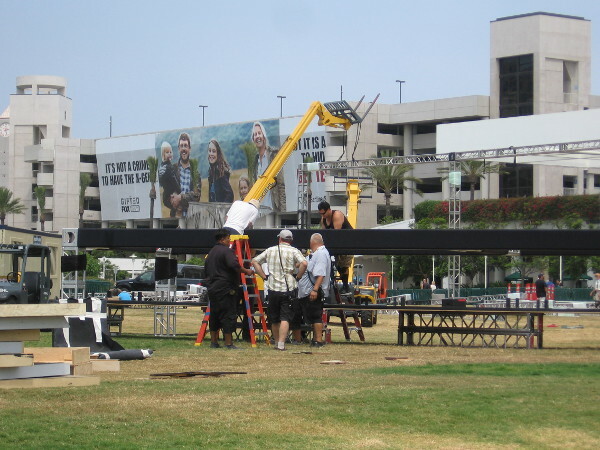 A big wrap is being applied to the Bayfront Hilton! 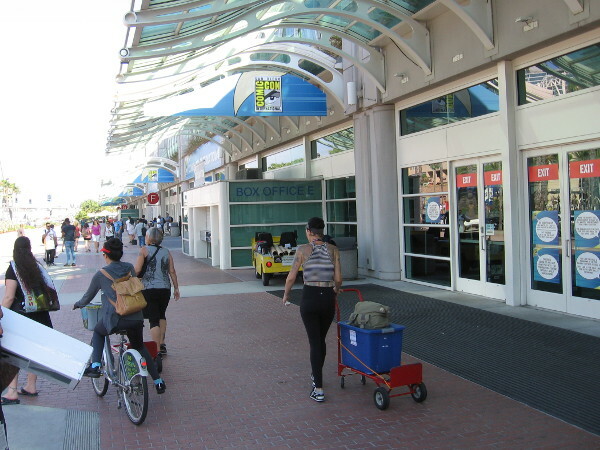 This afternoon I walked all around the San Diego Convention Center and the Gaslamp Quarter. 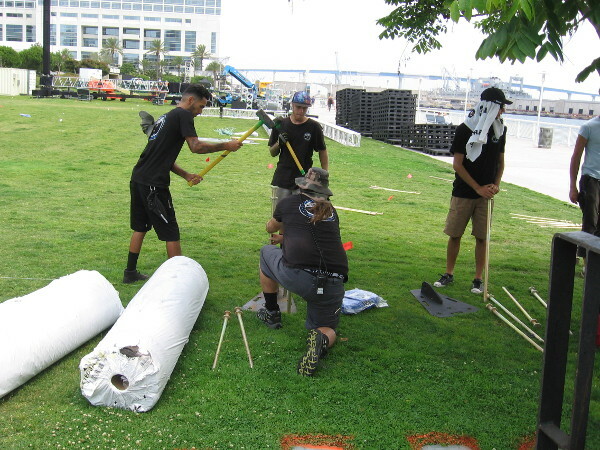 The application of building wraps and the construction of most outdoor venues is well underway with five days to go until Comic-Con! I didn’t walk around Petco Park. The Giants are in town through Sunday. I’ll probably head that way in the next couple days to see what, if anything, is going on! These guys are starting to set up the Adult Swim site. A guy said Fox will have their site in the middle area of the grass, like last year. Looks like a lot of work is still to be done! They’ve got five days! I see a wrap being applied to the Marriott Marquis! 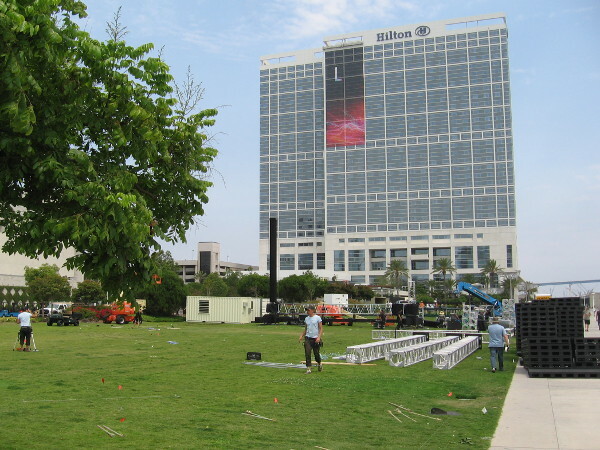 The outdoor site for FX this year, like past years, will be on the grass right in front of the Hilton. 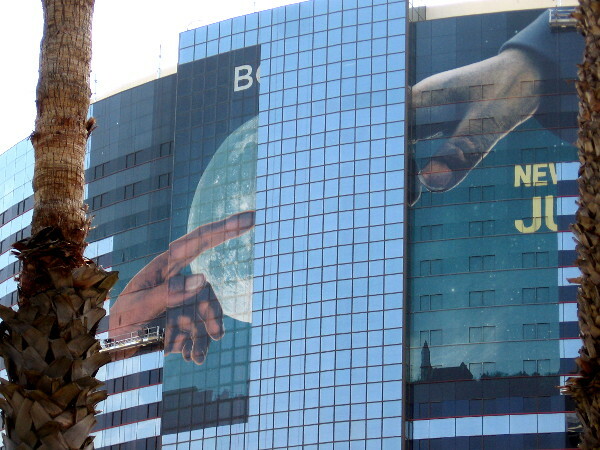 A closer look at the developing Marriott wrap. It will promote the TBS comedy television series People of Earth. Working on the Midnight, Texas attraction near the Tin Fish. 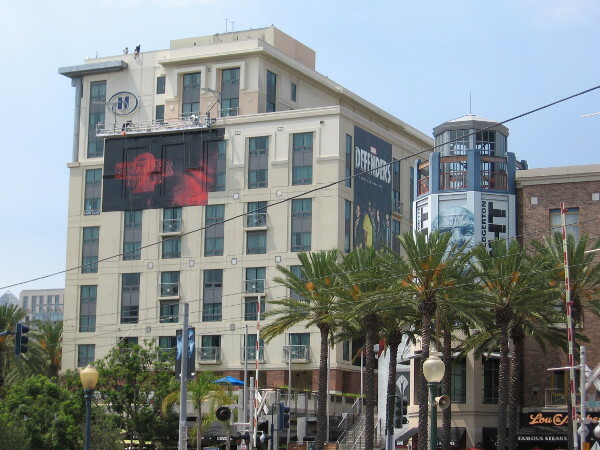 More Netflix wraps are going up on the Hilton Gaslamp. 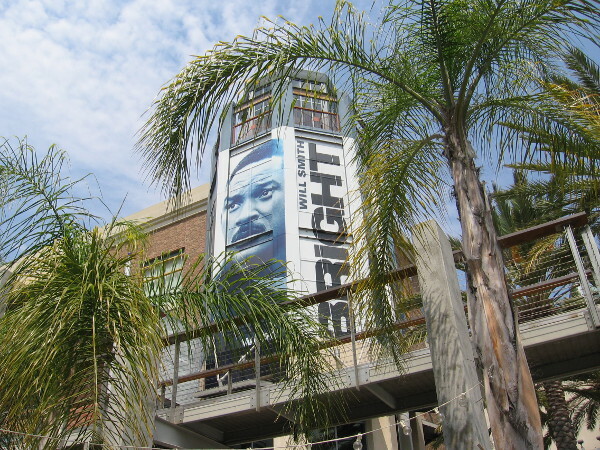 Will Smith peers brightly from between palm trees. 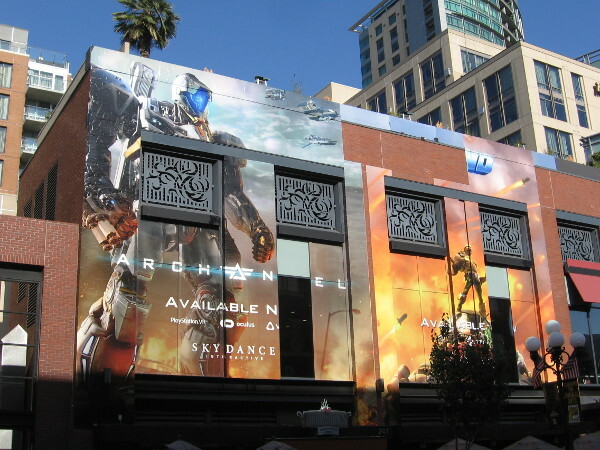 Looks like another strange thing is being attached to a building in downtown San Diego. Five days until the start of 2017 Comic-Con! I also noticed that work continues at The Tick Takeover site! 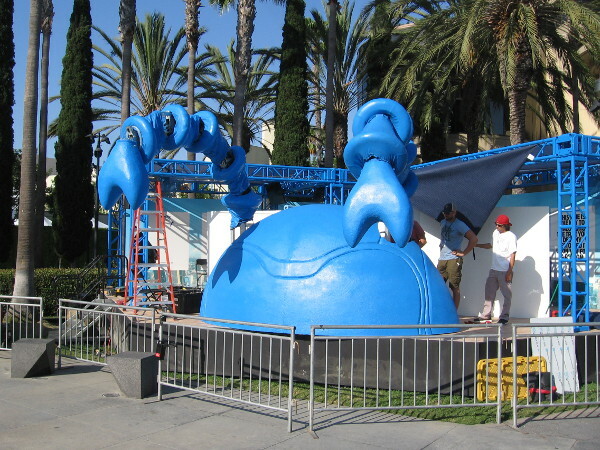 I haven’t seen a 20-foot-tall animatronic Tick yet! You’ll see it shortly after I see it! 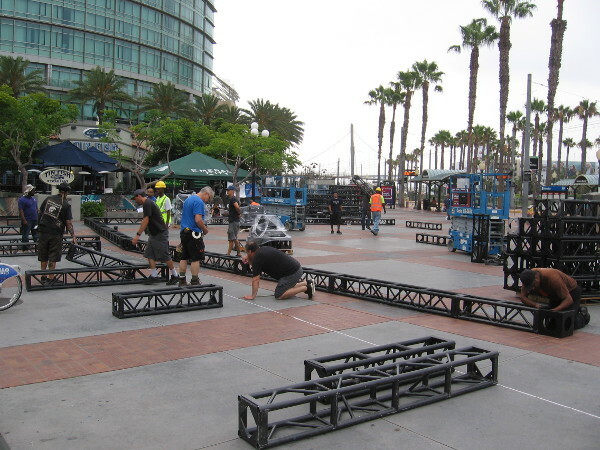 Posted on July 15, 2017 Tags advertisements, bayfront, comic-con, construction, convention center, cool, entertainment, events, gaslamp, movies, photo, pop culture, san diego, television5 Comments on 2017 Comic-Con wraps, construction underway! 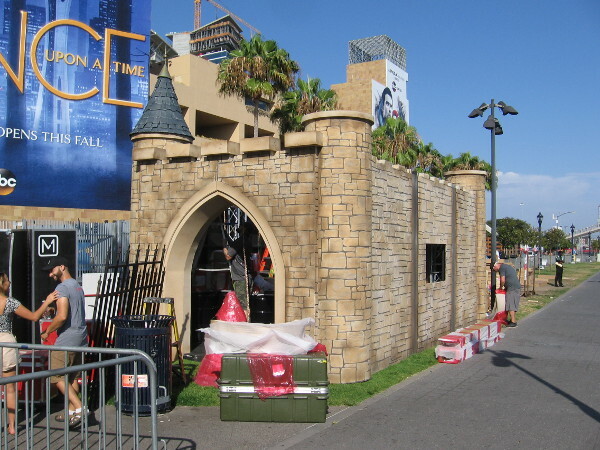 Comic-Con: Netflix wraps in the Gaslamp and more! 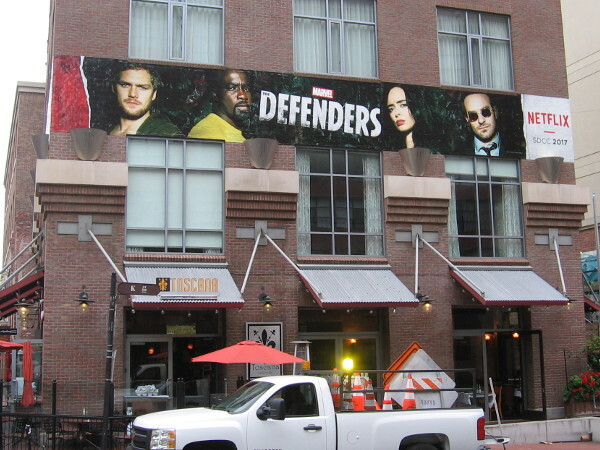 A cool wrap promoting The Defenders on Netflix has been applied to a Gaslamp building for 2017 San Diego Comic-Con. 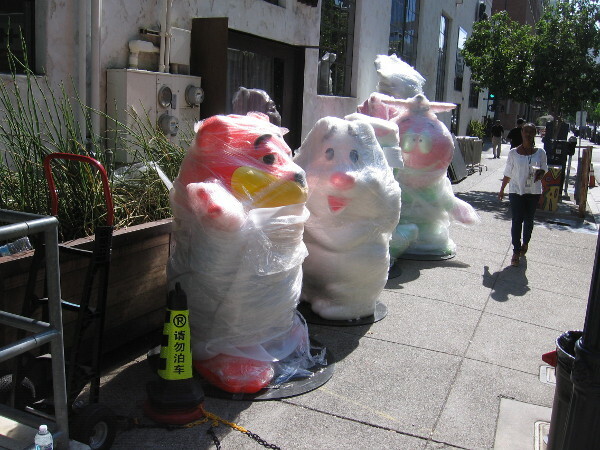 This morning there’s some Comic-Con preparation going on in San Diego’s Gaslamp Quarter. 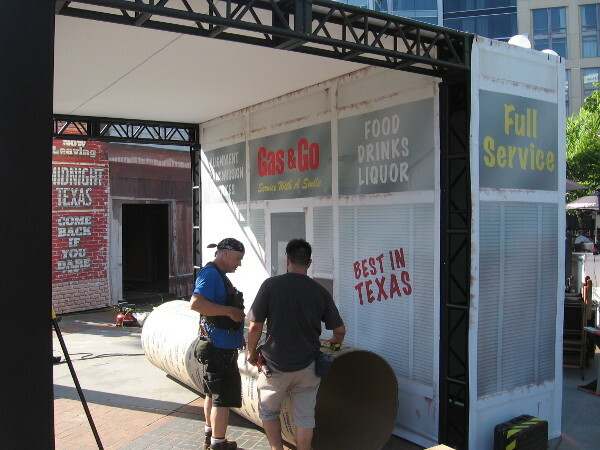 Three Netflix wraps are already up and construction has just begun on the Midnight Texas outdoor experience by the Tin Fish! A Comic-Con wrap in the Gaslamp promotes the second season of Stranger Things. The supernatural series thrills audiences on Netflix. 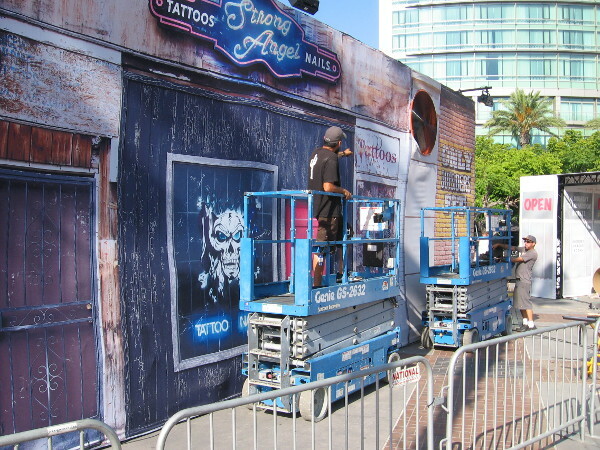 Construction has begun on the Midnight, Texas 4D experience near the Tin Fish, across from the San Diego Convention Center. The show is coming to NBC. 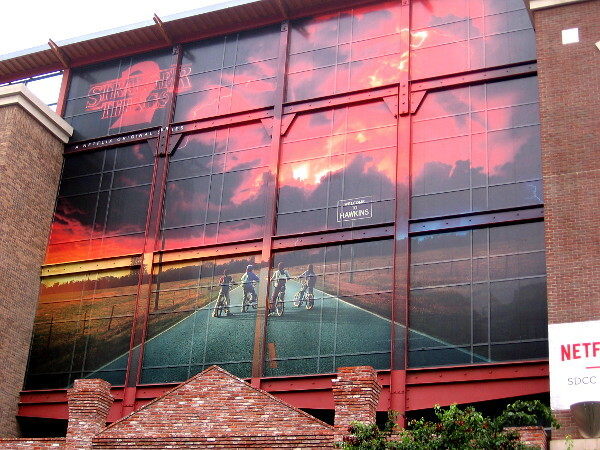 A third Netflix wrap on a Gaslamp building for Comic-Con. 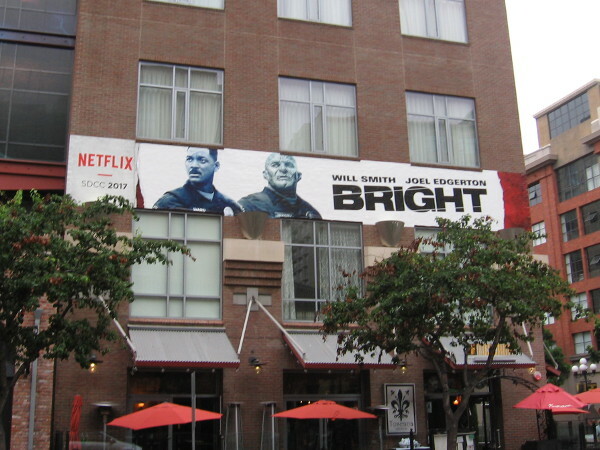 This one promotes upcoming fantasy film Bright, starring Will Smith and Joel Edgerton. 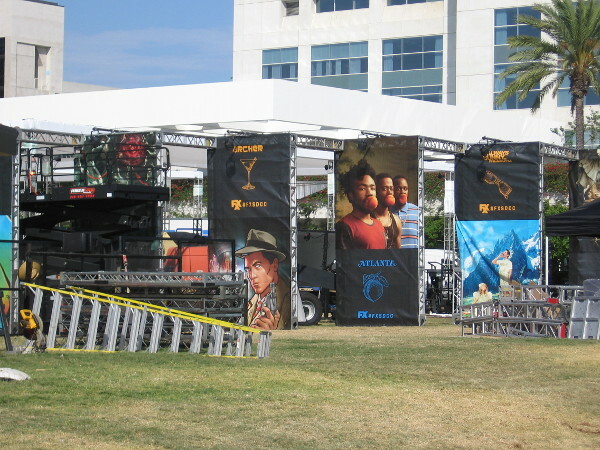 Posted on July 14, 2017 July 14, 2017 Tags advertisements, comic-con, construction, cool, entertainment, events, gaslamp, marketing, marvel, movies, photo, pop culture, san diego, television1 Comment on Comic-Con: Netflix wraps in the Gaslamp and more! 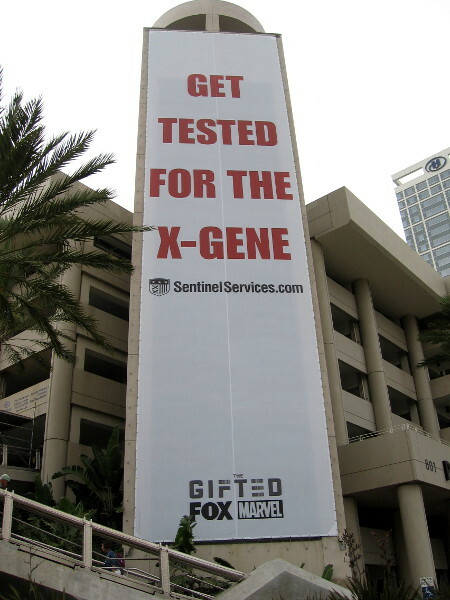 Comic-Con banners: Get tested for the X-Gene! 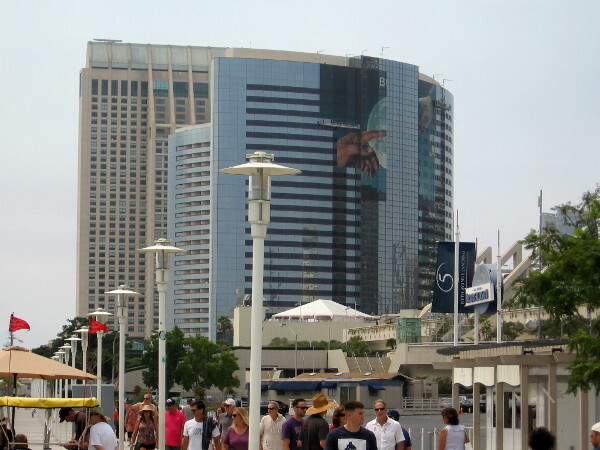 A huge banner hung on the Hilton San Diego Bayfront parking structure promotes The Gifted for 2017 Comic-Con. The X-Gene can’t be seen. Do your part. Get tested. Check it out! 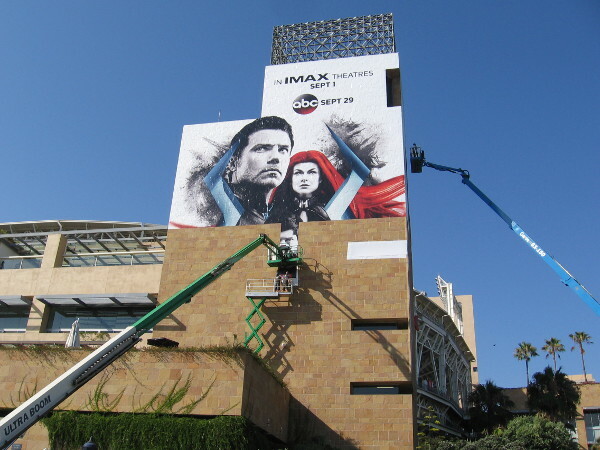 Three super huge banners have already been hung on a building for 2017 Comic-Con. They cover much of the Hilton San Diego Bayfront parking structure, and promote the upcoming FOX series The Gifted. In past years, I don’t recall huge banners like this appearing several weeks before the big event. I imagine tons and tons more cool stuff is on the way! Stay tuned! Marvel’s upcoming series about the mutant X-Men will be on FOX television. 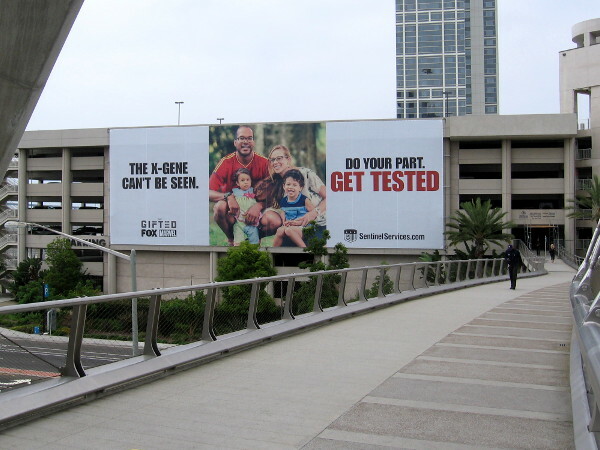 Get tested for the X-Gene. Sentinel Services. 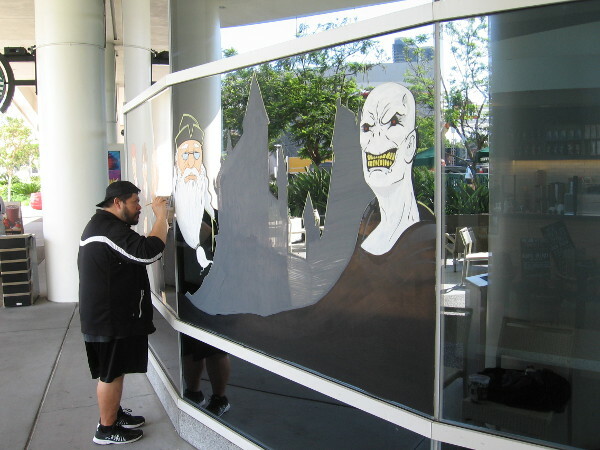 This promotional banner will be displayed on the Hilton parking garage during San Diego Comic-Con. A happy family provides a chilling message. 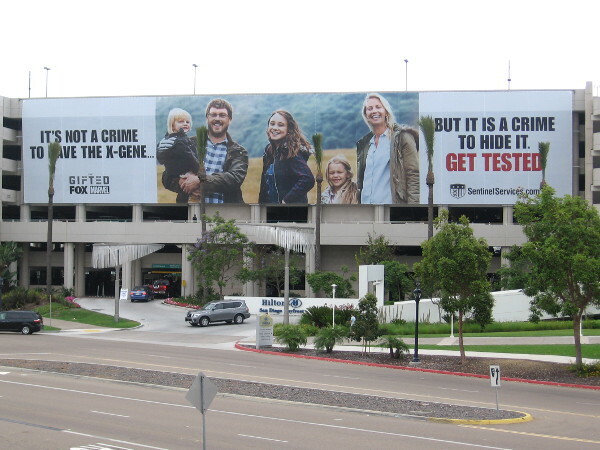 It’s not a crime to have the X-Gene. But it is a crime to hide it. Get tested. Or worse, you might mutate and become Sheldon Cooper. 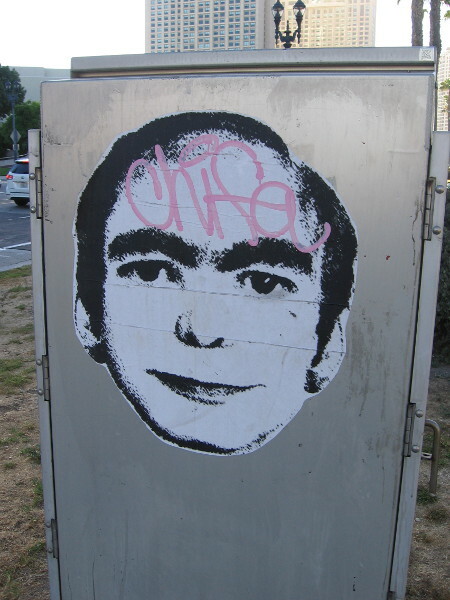 This is Sheldon, isn’t it? One super power, I suppose, would be brain power that almost matches that of Reed Richards. And an over-sized ego nearly the size of Ego. 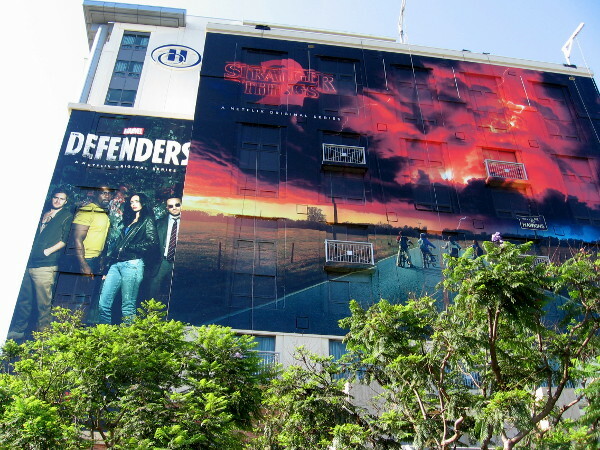 The first huge banners have appeared on a San Diego building for 2017 Comic-Con, several weeks before the massive international pop culture event! 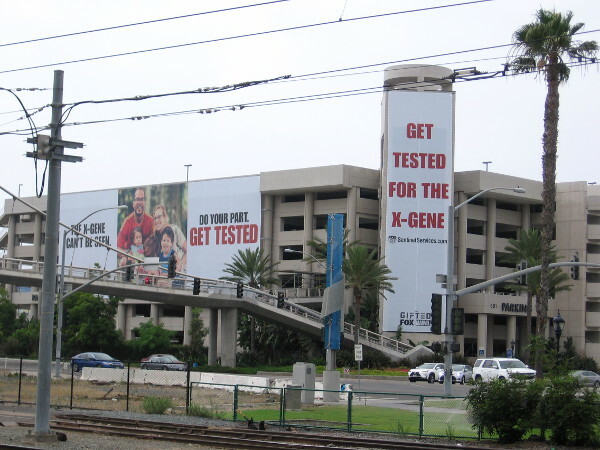 Posted on July 2, 2017 Tags advertisements, banners, comic books, comic-con, comics, cool, entertainment, events, marvel, photo, pop culture, san diego, television, x-menLeave a comment on Comic-Con banners: Get tested for the X-Gene!